Bay Nature Magazine: How Can You Tell It's a True Turkey Tail? Turkey tail (Trametes versicolor) is a species of fungus that closely resembles—you guessed it—a turkey’s tail. As a bracket fungus, named because of its shelf-like form, its job is to break down either the lignin or cellulose in rotting wood. But here’s a Thanksgiving — and beyond — conundrum: there’s an imposter out there, the false turkey tail (Stereum hirsutum). And there are several species of bracket fungi anyway. So how can you tell if you have a “true” turkey tail? 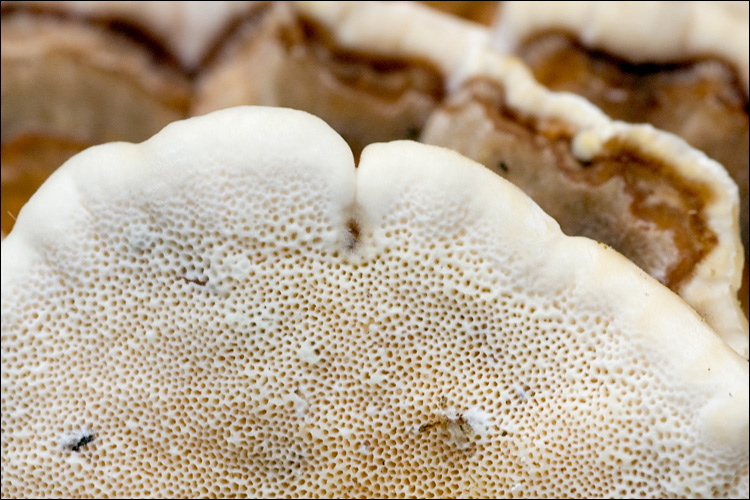 From the top side or cap of a mushroom, many of the bracket fungus species look quite similar. Turkey tail has a highly variable color range, most often within the brown to red range while false turkey tail often has a bright orange hue. Both species are highly zonate meaning they have separate concentric color zones, and surfaces that are velvety to touch. As if that’s not confusing enough in the field, Trichaptum abietinum, which lacks a common name, looks somewhat like a faded turkey’s tail with some washed out color variability and zonation. But fortunately, on the flip side, they couldn’t be more different. Debbie Viess, co-founder of the Bay Area Mycological Society, says the best way to check what species you have is to look at its underside. The underside of a mushroom is called the hymenium or fertile surface, where spores are produced and then drop to the ground. As a polypore, turkey’s tail holds its spores in tubes, so its underside should display tiny holes visible to the naked eye. As a crust fungus, the false turkey’s tail has a smooth to slightly wrinkly underside with no visible pores. Trichaptum abietinum is also a polypore but rather than pores or a smooth surface, it has little teeth or bumps of tissue where its spores are produced. Plus, you can’t miss its brilliant lilac cast. Adding one more to the mix Lenzites betulina is a polypore that possesses gills rather pores or a smooth surface, closely resembling the underside of an oyster mushroom.